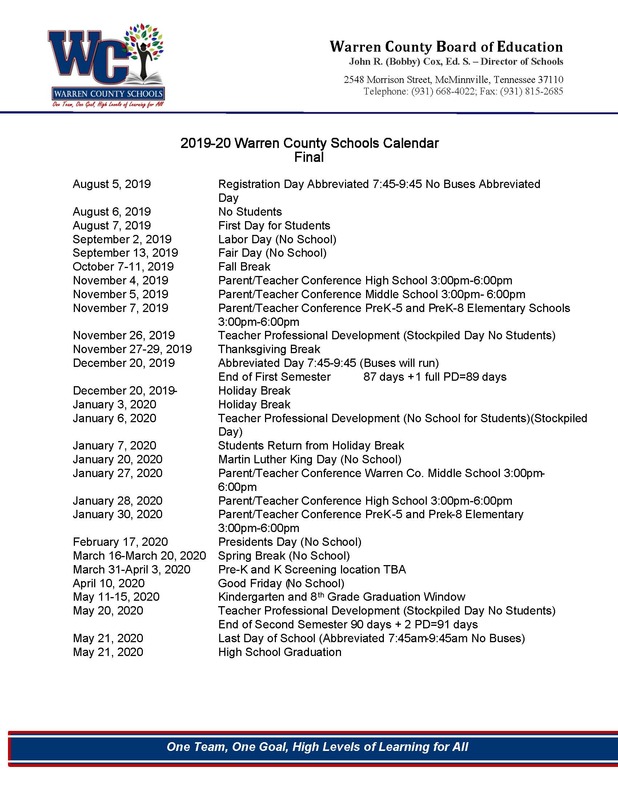 Warren County Middle School is a 6-8th grade school located in McMinnville, TN. We appreciate you taking time to visit our site. Feel free to contact our teachers or staff through e-mail or by calling (931) 473-6557. Visitors are always welcome at our school. We are starting a “WCMS Wall of Fame” and nominations are now being accepted through 5/15/19. Jump Street Field Trip May 16th. Keep Saving!! You need 100Tickets!! Warren County Volleyball Clinic will be April 29, 30, and May 1. The clinic will run from 3:30-5:00 @ WCHS. Any girl in grades 5-11 is invited to attend. Cost will be $40 which will include a clinic t-shirt. Pick up a registration form at the sign in/sign out desk. Tryouts for upcoming 7th grade boys basketball team will be held May 7th 3:00-5:00pm. Students wishing to tryout must turn in a Pre-Participation form on May 7th to Coach JT Morgan. SOFTBALL: tournament beginning Thursday, game time 7:30@Coffee Co. DRAMA: Rehearsal TUESDAY, APRIL 23, from 3:00 - 5:00 pm in the AUDITORIUM. Pick up at 5:00 pm in the 7th/8th parking lot. ALL CAST & CREW MUST ATTEND! PLEASE REMEMBER COSTUME PIECES! DRAMA: Rehearsal SATURDAY, APRIL 27, from 10:00 - 3:00 pm in the AUDITORIUM. Pick up at 3:00 pm in the 7th/8th parking lot. ALL CAST & CREW MUST ATTEND! BRING YOUR LUNCH. AR field trip will be Thursday, May 2. You must have your 300 AR points by Monday, April 29, by 3:00. See Coach McBride if you have questions. The Nutcracker Fantasy will be put on this Christmas at the Park Theatre. If there are any dancers interested in participating, please see the poster by the cafeteria for information or see Mrs. Cunningham in room #101. Auditions are May 11th. Also, there are many summer dance camps available for all range of dancers. Again, please see Mrs. Cunningham for information. Doughnut Party!! Guidance will be having an attendance competition for the 2 weeks of testing. The Classroom in each grade level that has the least number of absences during the weeks of 4/15-4/26, will get a doughnut celebration! !Posters will be placed outside the Cafeteria by grade level, with the number of absences for each day. In our mission to continually strengthen the relationship between the Sister Cities of McMinnville & Mikawa, Japan, through the friendships formed during the yearly cultural exchange WCMS students are invited to apply for SISTER CITIES 2019. Exchange dates will be July 27th-August 5th. Our students will be going to Japan this year! Current 7th-9th-grade students may pick up an application at the sign-in desk. Please return by April 14th. See Lori Riley with any questions. HOMELAND BANK WILL BE OPEN EVERY TUESDAY-Open a new account or deposit in an existing!!! !When you open a new account you will receive a Pioneer Pride ticket. Also, for every deposit a student makes, once a week, they will get a Pioneer Pride ticket!! We are collecting BOXTOPS for PE equipment. BRING IN YOUR BOXTOPS TO HOMEBASE OR THE MAIN OFFICE!! All current Interact members are asked to help with Fuel Bags on Tuesday, April 30th, from 3:00 to 4:00 pm. Pick up will be in the 7th/8th grade parking lot.